The following post contains major spoilers for IT. There's more to IT than meets the ear. 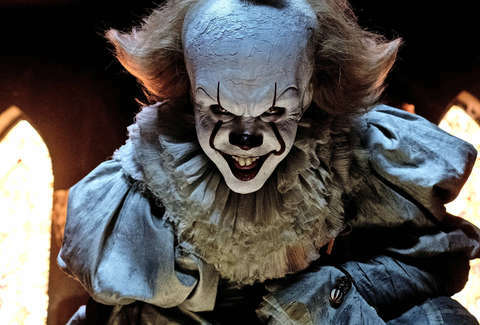 Because Andrés Muschietti's remake is really a coming-of-age story disguised as a clownish nightmare, composer Benjamin Wallfisch refused to create a stock soundtrack. "I didn't approach IT as a horror at all," he told us. "It's an adventure score." The source material's tone, which bounces between the happy-go-lucky zings of preadolescence and the terror of an otherworldly demon luring kids into sewers, made the 37-year-old Englishman work hard to avoid the clichéd tension-release-jump-scare structure you hear so often in contemporary movies. He did so by waiting to see a rough cut before beginning his work, learning early on that he'd have to imbue the music with its own sense of journey and character depth -- IT's more about these kids growing together than the scares, after all. Benjamin Wallfisch: The chant you hear near the end is this very strange, 18th century children's play song called "Oranges and Lemons" -- Andy actually had the idea to use it. There's a strange dissonance and dichotomy between the words and the melody. It's a conversation between bell towers, effectively trying to chase down a child who stole something from a market and who is eventually executed. There are lots of hidden messages in that song, which we were really excited about -- particularly the words at the end about having your head chopped off. It became Pennywise's inner monologue. The song is 300-400 years old, as is Pennywise, which felt kind of perfect for his Victorian clown persona. You hear the chant whenever he's thinking about attacking. In the opening sequence, up to the title, we planted the seed of "Oranges and Lemons" sung by solo child in the beginning, and then you have the iconic paper boat chase and the drain conversation, where Georgie meets Pennywise. What we did is we disguised the "Oranges and Lemons" song as a kind of play song you might hear at the circus, because Pennywise is talking about cotton candy and popcorn. After the horrific attack, there's a visually potent sequence where we cut to black and out of the center of the screen there's this pin of light that gets bigger and bigger and turns into a tunnel. As the camera rotates, you see the title IT come toward you, which gave me the opportunity to use a totally over-the-top crescendo from something quite small to the song being literally screamed in your face -- those are actual kids screaming! We had a group of very talented and wonderful kids sing it in all different characters: quietly, whispered, angry-screaming. Of course, they loved screaming [laughs], so they really went for it. Wallfisch: I didn't pull inspiration from any physical places; it was more about how it felt on the screen. I wanted it to feel like Derry had real history -- in the sense that it's a town that has always wanted to be at peace, has tried to do everything right, but can just never quite escape IT's presence. There's a sadness there, but there's a sort of nobility too. This is a town infected by this evil, but one which has kids at its heart that will fight It. So there's hope as well. Melodically, it was about balancing that sense of hope with a tinge of melancholy, and all of it being imbued with a sense of history. Wallfisch: This is one of my favorite scenes. As soon as the projector becomes demented, each slide accelerates and there's this extraordinary built-in rhythm. So the very first thing I did was wrap my head around the rhythm -- not just the projector's rhythm, but the way editor Jason Ballantine was intercutting the shots. There's basically a ramp of tension that builds right to the end, when the garage door comes up, but within that there are certain plateaus where you build and you go to one place and you think, OK, that must be the height, but then you go even further, and then you go even further. IT becomes larger than life, physically. He's magnified by the projector and becomes this enormous version of himself. So, musically, we have to go beyond anything we've done up to that point to communicate that, but be very much locked into the mechanical world of the slides, the binary nature of the light. One of the most basic parameters of music is figuring out whether you have sound or silence. So I was able to become very primal in the compositional choices there, using a lot of percussion and synths. We were very aware of how powerful the silence and the black on the screen would be. Wallfisch: On one hand, it's the classic haunted house, but on the other hand, I didn't just want to do a cliché haunted house tension cue. It was all about: whose point of view are you playing from as a musician? In this case, the sequence is being led by Bill and his courage in his quest to find his brother. So he leads them into the house, they explore it, they subject themselves to all of IT's crazy pranks and tricks. In a strange way, it's kind of a playful sequence. You'll hear times when Pennywise is taunting these kids almost with a dance. You'll hear incredibly percussive, almost operatic moments, plus moments where you have a strange circus organ and then you'll hear something very quiet that's also intriguing and gentle. It was all crammed into this seven-minute sequence in the movie, and the key thing is for it to feel logical and effortless and also very entertaining. We wanted the audience to be fascinated with this insane place. It wasn't enough to just enhance what was on the screen. It had to feel like Pennywise was controlling every aspect of their experience and carefully orchestrating every moment. So his presence was everywhere, but IT was felt in all kinds of varied ways, depending on the point of view of the character -- like when Richie is suddenly confronted with all the clowns in the clown room, and Eddie is confronted with the leper. It fascinated me that all the adults on the screen are all infected by this evil; they're almost as bad as Pennywise himself. Traditionally, you portray kids with a sense of innocence and a sense of levity, and the adults get the big themes. But in this case that was entirely flipped: All the adults could be summed up in one tone or in one color, whereas the kids had this incredibly multifaceted, rich character depth, which I had to work very hard to capture in the score. Wallfisch: This sequence, musically, comes in two parts. The first half of the cue is Bill cutting their hands, but then there's a moment where they all hold their hands and there's a kind of shift -- when he cuts Beverly's hand. The flute comes in and the guitars come in and the orchestration shifts and the tonality shifts to something much more hopeful. I was going for a sense of depth, they deeply mean this oath from the bottom of their hearts. They're swearing on their lives that they'll come back. And then in the second half, when they're just looking at each other, it's like they're kids again. It's them promising that they'll always be friends and that they'll always be a group -- even though they'll go in their own directions. This experience is their journey from childhood to adulthood, their rite of passage.